Transparency Market Research (TMR) has published a new report titled ‘Polymerase Chain Reaction (PCR) Consumables - Global Industry Analysis, Size, Share, Growth, Trends, and Forecast, 2018–2026.’ According to the report, the global polymerase chain reaction (PCR) consumables market was valued at US$ 434 Mn in 2017 and is projected to expand at a CAGR of 4.8% from 2018 to 2026. The report suggests that increase in use of polymerase chain reaction consumables in quantification of plant mutations and genetically modified organisms, assessment of bacterial and viral loads and absolute pathogen counts, quantification of NGS libraries, and detection of cancer in body fluid and stool DNA are likely to drive the polymerase chain reaction consumables market from 2018 to 2026. The molecular diagnostic industry has emerged as a major driver of development in PCR technology-based amplification techniques. The demand for greater efficiency and productivity in the pharmaceuticals industry has led to the growth of the polymerase chain reaction consumables market. PCR technologies have been used to identify and analyze potential drug targets due to the introduction of personalized medicine. 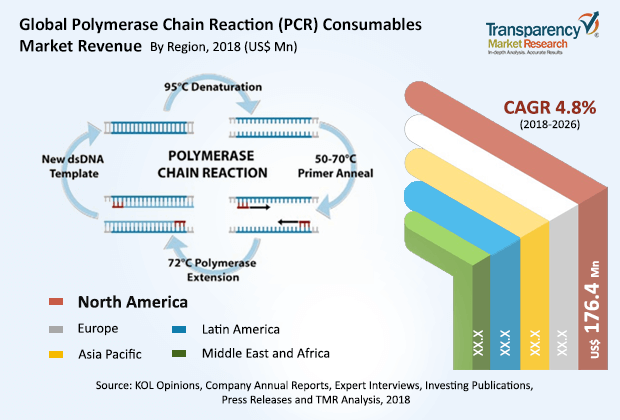 Other major factors driving the polymerase chain reaction consumables market include enhanced automation, rise in demand for analysis technologies, research-intensive investment by various biotechnological companies, and wider application areas of PCR technologies. The report offers detailed segmentation of the global polymerase chain reaction (PCR) consumables market based on product and end-user. In terms of product, the PCR tubes segment is anticipated to have high share due to high adoption of PCR tubes in research and academic institutes as well as clinical diagnostic laboratories and hospitals. The research and academic institutes segment is expected to account for a leading share of the market in 2026. The segment is also likely to expand at a rapid pace during the forecast period. PCR has become a functional tool in the mainstream life sciences and chemistry disciplines. Its applications range from molecular genetics to microbiology assays and are expanding beyond traditional areas. The clinical diagnostic labs and hospitals segment accounted for over 24.3% market share in 2017. The combination of exceptional specificity and sensitivity, low contamination risk, and low detection time has made PCR technology a better alternative to culture- or immunoassay-based testing methods for diagnosing various infectious diseases. North America held a prominent share of the global polymerase chain reaction (PCR) consumables market in 2017. The market has witnessed significant technological advancements, as companies have introduced newer PCR technologies and protocols. In addition, a large number of market players in the U.S. are focusing on R&D to introduce applications that would expand the use of PCR in new areas such as next-generation sequencing (NGS). Moreover, high awareness about latest health care technologies and higher purchasing power and affordability are anticipated to boost the PCR market in North America. Favorable reimbursement policies in the region also enable patients to avail of the best of health care facilities. The polymerase chain reaction (PCR) consumables market in Asia Pacific is expected to expand at a rapid pace mainly due to improving health care infrastructure, rising private and public investment in life science research, and technological advancements in countries such as China and India. Less competition in Asia Pacific is encouraging a large number of instrument manufacturers to enter the market. QIAGEN established its Asia regional headquarters in Shanghai, China, in 2006. Presently, the company has a strong base in Asia Pacific, primarily in China, Singapore, Japan and India. The report also provides profiles of leading players operating in the global polymerase chain reaction (PCR) consumables market. They include Bio-Rad Laboratories, Inc., Hoffmann-La Roche Ltd., Inc., Thermo Fisher Scientific Inc., Qiagen N.V., Merck KGaA, Agilent Technologies, Inc., Eppendorf Group, 4titude, Corning Incorporated, and Greiner Bio-One International GmbH.